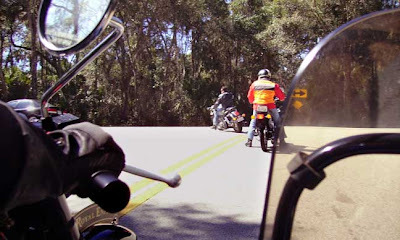 Royal Enfield riders experience "The Loop" near Daytona Beach Florida. The Hindustan Times recently informed readers that Americans think Royal Enfield motorcycles are "hot." Times writer Anirudh Bhattacharyya seemed to think it surprising that the Bullet would make its mark outside India. "You read that right, the Bullet. The stolid bike that appears to have all the oomph of the sturdy Ambassador. But not here. With its lineage, which goes all the way back to pre-World War II Brit bikes, Royal Enfield has gained cultural cachet in the U.S. and revved into the territory of cult chic," he writes. The article goes on to explain that Royal Enfield sales in the U.S. are small, but expected to grow, as the dealer network expands and the U.S. comes out of recession. Bhattacharyya notes that Royal Enfield already has a vibrant on-line community in the U.S., thanks to the extremely active Community Forum on the Royal Enfield USA website. It's Royal Enfield USA president Kevin Mahoney he quotes saying that the brand has become "hot" in the U.S. The author was kind enough to mention me: "David Blasco, a retired photo editor with the Miami Herald, is its leading booster, with a regularly-updated blog and a Facebook page supplemented by Twitter feed." I don't know if I am the "leading booster," but I admit I'm enthusiastic about Royal Enfield. Do I see flaws? Oh, sure. But, then, my has dad rooted for the Chicago Cubs all his life, so, genetically, I find it easy to overlook small problems. "The Enfield's engine is a charming reminder of the way things were— basic in design, easily diagnosed and repaired... In economic terms, the Enfield's selling price is good value for money, it uses gasoline sparingly, and there is a ready availability of replacement parts." Hot? Maybe not. Cool? Maybe so. Interesting? That's for sure.